The 91st aircraft, pictured below, is a U.S. Marine Corps F-35B, to be delivered to Marine Corps Air Station Beaufort, South Carolina. In 2018, deliveries included 54 F-35s for the United States, 21 for international partner nations and 16 for Foreign Military Sales customers. 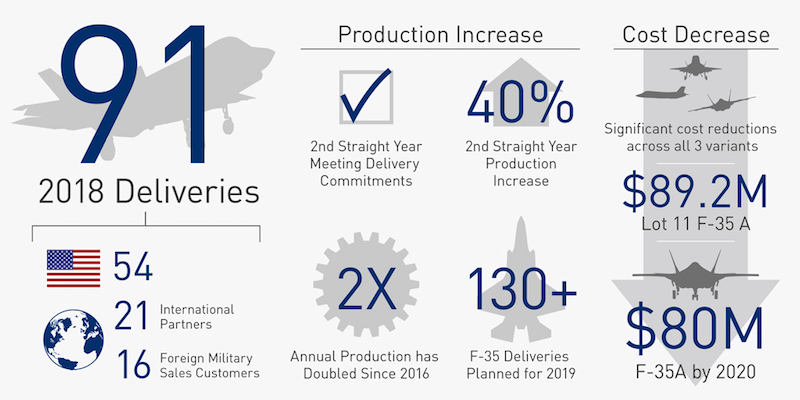 The F-35’s mission readiness and sustainment costs are also improving. Lockheed Martin’s sustainment cost per aircraft per year decreased three years straight, and by about 15 percent since 2015. The joint government and industry team is also taking aggressive actions to deliver 80 percent mission capable rates and reduce costs per flight hour by about 40 percent.